Lets face it, often we do not have the time or money to visit the salon for a great pedicure. So here are simply tips to get the same professional look in the comfort of your own home. (1) Soak your feet in warm water for five minutes. For an extra treat for your tired feet just add some bath salts to the water. Your feet will love it! (2) Pat your feet dry with a towel. Slough off the dead skin with a foot file. You can find foot files at any drugstore or big box retailer. Use a file with a medium grit to get the best results without damaging your feet. (3) Trim your nails straight across with a straight edge clipper. You should use three cuts per toe nail. This way you will avoid cutting your nails too short. 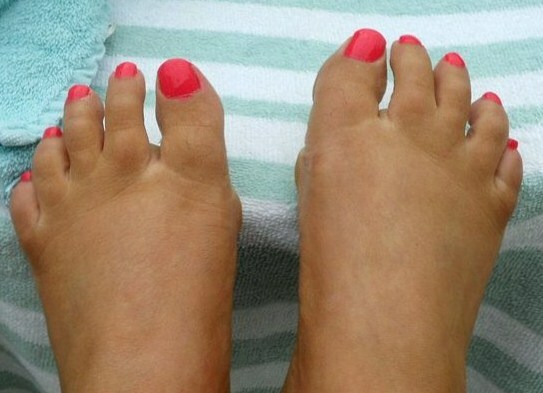 If you trim your toenails too short you run the risks of developing ingrown toenails. (4) Then smooth the edges off of your toe nails with a file. Use a fine grit file so you will not damage your nails. You can to find a fine grit file at the same store you purchased your foot file at. (5) Next rub a cream all over your feet. Its is best to use a foot cream, but in a pinch, a body cream will work. Concentrate on your heels and cuticles. These areas are driest parts of your feet. (6) Now its time to prepare your toenails for polishing. Clean your nails with a lint free cotton pad soaked in polish remover. This will remove the oil from your nails, making your color application look perfect. (7) Then apply a base coat, 2 coats of color, and a top coat. Make sure let the polish dry thoroughly and then your ready to go! By following these easy steps you will look as though you just stepped out of the salon. sure shot– If you like to follow hot fashion trends, get some magenta nail polish. This color is the biggest color trend in nails going on right now. This color will be on manicures and pedicures everywhere this season. It is not for the shrinking violet because everyone is going to notice you with this color. pink-a-boo – You are sure to love this color. It is a soft pink and all the fashion rage this year. It will be a staple nail polish in your collection. This color looks great with every skin tone. It can be worn for any occasion. It is just a classic color that you will want to wear all the time. she’s a perfect picture – This is lovely lilac shade. It looks flirty and fun. It will look perfect with warm weather outfits, especially those sundresses. This is a great accessories to have this season. no more film – This deep violet color is sure to add that needed pop to your outfits this season. Jewel tones are a huge fashion trend right now. So this color will fit right in. You can bet you will see this on many toes this year. It is a beautiful color for a pedicure. For more information on this collection checkout Essie’s website at http://www.essie.com. You can purchase these colors at any major drugstore chain, beauty retailer and online.